Kids are such funny creatures. Last weekend, I was upstairs doing laundry. Brantley and Holden were both up there with me and I noticed that Brantley had grown very quiet. I went looking for him. 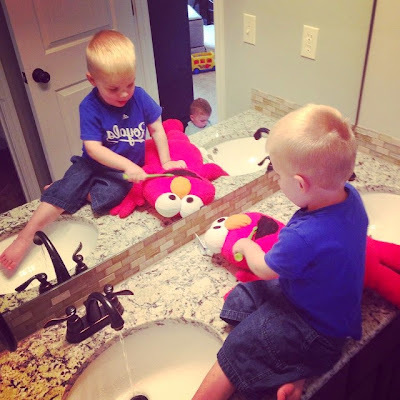 Low and behold, I found him in his bathroom, on the counter, with the water running, brushing Elmo's "teeth". 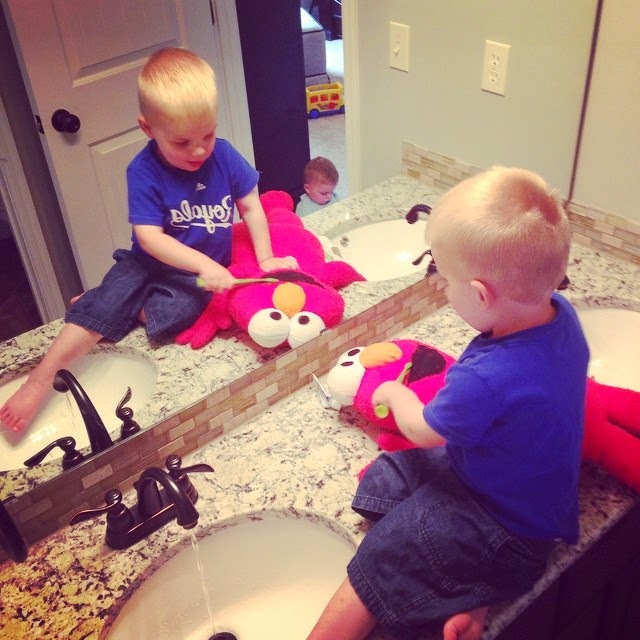 I didn't even know the kid could climb onto the counter, so everything about this was hilarious to me. He told me that he had already brushed Cookie Monster's teeth. Of course he had! A couple of nights ago, I was preparing dinner while the news was on t.v. Tom Brady and the cheating scandal was being discussed, so what did Brantley do? Grab his Chiefs hat, put on his sneakers, and go find his football. Without pants, of course. He proceeded to tell me he was playing "Chiefs". I love how his mind works! 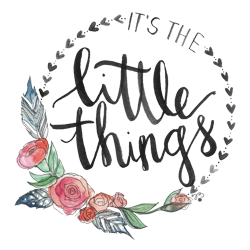 And one more "little thing" to share. It's normal for Brantley to eat a banana every morning before leaving for daycare. His newest thing is sharing it with his brother. If this isn't isn't one of the sweetest things ever, I'm not sure what is! 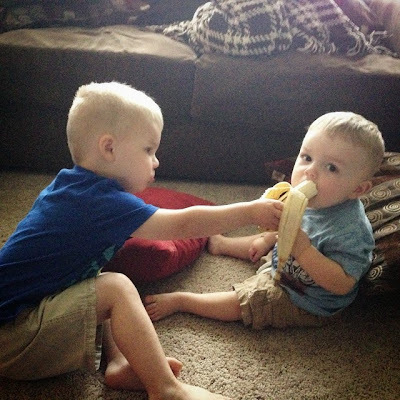 He can be ornery, he can be a little you-know-what, but when it comes to his brother, Brantley has the biggest heart. Happy Wednesday! 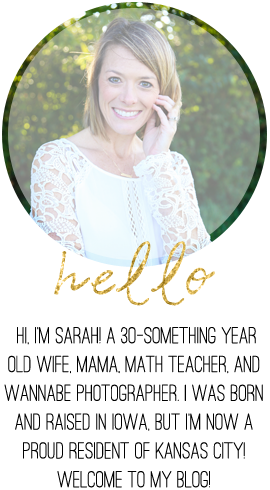 Linking up with Sadie Sky Blog. That's so cute! Sometimes Sophie will imitate us as well. When I brush my hair, she likes to brush her hair too. What a little cutie!! And so smart! That connection he made to the news, that's awesome! Love it when siblings share with each other!! That banana pic!!! 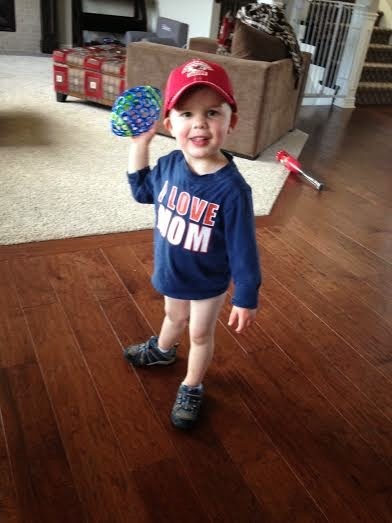 The pants-less Chief - yes! So sweet to see such brotherly love.